Islands, large and small, occupied and deserted, capture the imaginations of lovers. Close to water and rich with marine life, islands beckon as a romantic escape far from home. On some, existence feels raw and primitive; humans are at the mercy of the tides and the elements. Others, with the trappings of civilization, offer a self-contained world with everything two could desire within reach. Regardless of the island you choose to visit, the sensuality of these settings is palpable. Cross the seas to your next getaway. Of all the islands in the Caribbean (and there are many; the Bahamas alone claims 700), St. Lucia is among the most romantic. The swoon-worthy combination of the towering Piton Mountains, lovely beaches, and warm turquoise Caribbean Sea certainly makes it one of the most picturesque. And frequent flights from the United States make it quite accessible. Get out and see the island, making your way to the Castries market to stock up on St. Lucian spices that grow on trees, and drive down to Soufriere for a fresh seafood meal by the harbor. Each of Hawaii's major islands is worth exploring, but romantic couples with a sense of adventure may love Kauai the most. Achieve a sense of place by taking a helicopter tour of "The Garden Isle," exposing the Na Pali coast and Waimea Canyon's verdant cliffs, tumbling waterfalls, and unpeopled beaches. Or hike the 11-mile Kalalau Trail overlooking Na Pali. With any luck, you'll see it all against a rainbow sky. Swim and sunbathe on any of the island's 43 white-sand beaches. And just for fun, take a movie-set tour: More than 60 feature films were made here, including Jurassic Park, Raiders of the Lost Ark, and South Pacific. There are more than 100 gorgeous islands in the South Pacific Ocean. Among them are Tahiti, Moorea, Tahaa, and Huahine, places any couple would be thrilled to loll upon. 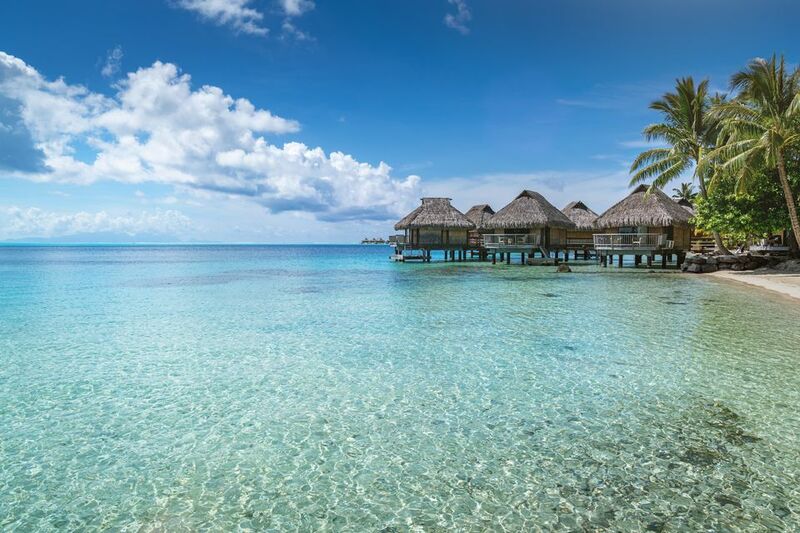 Lined with beaches lapped by the purest waters and fringed by palm trees, Bora Bora replicates paradise. Explore lagoons, swim, snorkel, walk hand-in-hand along deserted beaches. Hike Mount Pahia or Mount Ohue. And simply relax, breathe in and revel in each other's company. Before The Lord of the Rings enchanted audiences with New Zealand's magnificent, and often otherworldly landscapes, couples in love came here for the wine, the wildlife, and the waves along sandy shores that were rarely crowded. Visit Ninety Mile Beach in the far North (it’s actually 55 miles long, but still magical). The vast dunes seem positively desert-like. Thrill seekers can ride an ATV bike across them. A glorious island in the Sea of Naples with a picturesque harbor, Capri was popularized by the jet set and known as a playground for the international rich and famous. Kiss under the Blue Grotto, a luminous sea cave, and by the Faraglione di Mezzo archway. Both need to be reached by boat. Later, toast yourselves at an outdoor café with a glass of limoncello made with lemons from nearby fruit trees. Surrounded by the Great Barrier Reef, Qualia resort is located on the secluded northernmost tip of Hamilton Island. Adding to the resort's quiet and calmness, guests must be at least 16 years old. Explore the Great Barrier Reef by snorkeling, scuba diving or on a reef tour. Or laze by one of the two pools, curl up in the library, or visit the spa and fitness center. Accommodations consist of 60 private pavilions handcrafted from local lumber and stones. Interiors are nature-inspired. The resort has two restaurants, and you can even indulge yourselves by having the chef cook for you in your own pavilion's private deck. The time to socialize is at sunset, quaffing cocktails at the Hamilton Island Yacht Club. There are as many as 6,000 islands along Greece's irregular coastline, although only about 200 are inhabited. Of those, none woo romantics like sun-blissed Santorini, which is the most visited. The sight of Santorini's iconic white stucco structures set against the blue Aegean Sea make hearts soar. And to add a frisson of danger, sulphurous emissions and the occasional red glow remind visitors that Santorini's live volcano is merely asleep. Santorini has an active nightlife, centering around Fira and, to a lesser extent, Oia. During the day, go for a hike... if you can steal yourselves away from the beach. The best time to visit is October, when the crowds are thinned. Tourist attractions remain open till November. You won't find large hotels on Santorini, but you can choose from villas, spa hotels properties. Hundreds of sandy islands in the Indian Ocean, the Maldives is home to more overwater bungalows than anywhere else on earth. That's one reason romantics are willing to fly for many hours to reach islands only a few hundred miles from India. While you're there, snorkel in the clearest, shallow waters filled with colorful tropical fish. Dine at Subsix at Niyama, which lies six dry meters below the ocean. You'll feel as if you're inside an aquarium. Not every couple considers a remote, sandy island the epitome of a romantic escape. Perhaps that's why Manhattan is favored by many honeymoon couples and others who crave excitement, sophistication, and surprises around every corner. To make the most of your time in the city, walk. Not only is Manhattan flat, most of it is on a grid pattern so it's very easy to get around. And there are amazing neighborhoods to discover! Greenwich Village, Chinatown, the Lower East Side and Central Park all have their charms. But unless you want to treat yourselves to a Broadway show, avoid Times Square. It's filled with clueless tourists who don't realize the real New York is just beyond it. Here are the city's most romantic hotels to keep in mind for your stay.